Last year Australia’s payments industry hit a major milestone — cards became more popular than cash for the very first time. In 2017, the Reserve Bank of Australia revealed that over the past decade cash payments had fallen by half, while card payments had almost doubled. There’s no doubt that card payments, particularly of the tap-and-go variety, have quickly gained in popularity among Australian consumers. A new report commissioned by Square revealed that 81 per cent of consumers now prefer cashless forms of payment, and one in three are reportedly card-only shoppers who don’t carry cash. 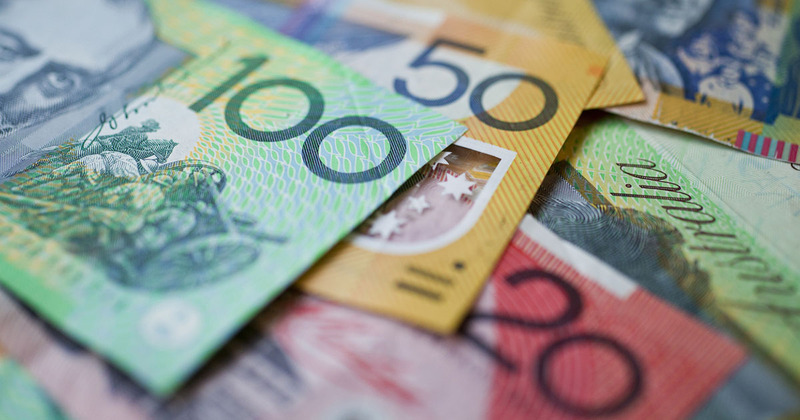 The Square research also revealed that the traditional “cash is king” mindset of Aussie business owners has started to shift. It’s no surprise when you consider the amount of staff time spent on cash-associated management in an average small and medium-sized business (SMB), which the report reveals is more than 200 hours per year! This is a cost that is no longer going unnoticed, with more than 60 per cent of business owners agreeing that going cashless would completely reduce time-waste for staff. The adage “time is money” seems to ring truest when it comes to the pros and cons of accepting cash for SMBs. Square’s research revealed that Aussie businesses spend an average of 216 hours per year (that’s almost 29 working days) handling, counting and banking cash. When we consider that the minimum wage for an Australian worker is just over $18, handling cash is costing the SMB sector a minimum of $8.7 billion in annual staff wages. That’s time that SMB could be paying their staff to improve their product or service offering, refine process efficiencies and boost their bottom line. 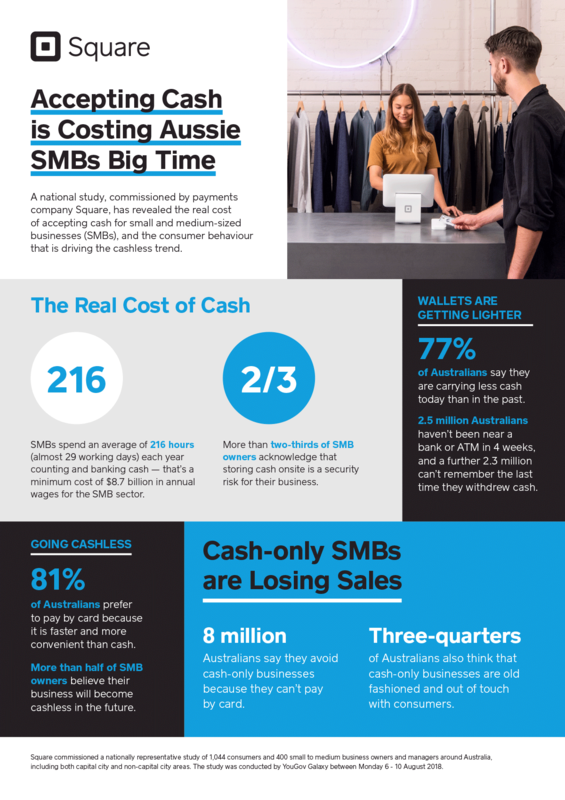 The rising popularity of payments technology has also resulted in more negative consumer sentiment towards cash-only businesses, with our research revealing that three-quarters of Australians now believe cash-only businesses are old-fashioned and out of touch. Not accepting cards, and other cashless forms of payment, is now negatively impacting the bottom line for cash-only businesses, which lose an average of 8 million customers per year (41 per cent of the population) because consumers avoid places where they can’t pay by card. Consumer preference for card payments does not come as a surprise when you consider that the average Aussie is only carrying around $50 in their wallet now, with our consumer research finding that Millennials are carrying even less, with just over $30 on average. Even the recent removal of ATM fees by Australia’s biggest banks hasn’t seemed to sway consumer behaviour, with 2.5 million people reporting they hadn’t withdrawn money in at least four weeks, and a further 2.3 million stating they couldn’t remember the last time they visited an ATM. With the numbers heavily weighted towards Australian consumers driving us to become a cashless society, SMB owners have also started to realise the benefits of digital payments. The speed, ease and convenience of card payments is capturing the attention of savvy business owners, like Nathan Dalah, across the country. Nathan took his popular Sydney-based sashimi salad bar chain, Fishbowl, cashless earlier this year after finding cash to be interruptive and time-consuming for his business. More than half of the business owners surveyed agree, acknowledging that their businesses will become cashless in the future, with 35 per cent believing the transition will happen in the next five years, and 10 per cent of those thinking it will happen even sooner — over the coming 12 months.